On a voyage around the world there is no avoiding a lot of sea days at the end crossing the Atlantic Ocean. On this trip there were seven sea days between the Cape Verde Islands and Fort Lauderdale, broken only by the day in San Juan that was the subject of the previous episode. That doesn’t mean that everyone is napping in the sun the whole way though, since there is always plenty to do. This included the crew shows by the Indonesian & Filipino crews, a goodbye assembly featuring the officers and crew, and good-byes to all your friends on board (not to mention packing, which we won’t). The crew shows are always entertaining, colorful and very well attended. The crew members put a lot of work into these shows, rehearsing in the little spare time they have away from their jobs. The Indonesian crew show was on April 24, the day before we reached Puerto Rico. It started with a sort of glove dance, involving interactive movements by crew members lined up and wearing white gloves. Next up was a group of three singers, then a very impressive Indonesian dancer (who had been our waitress in the Pinnacle the day before). Note how expressive her hand gestures are; our hands won’t bend in that way at all. A group of crew supervisors performed in sunglasses and glittery costumes, then two women danced wearing long yellow scarves. Next was the monkey dance, depicting a story from Hindu mythology. The guys sitting on the floor are all monkeys, an evil spirit comes to take away the queen & the good king shows up in the end to make everything come out right (we may well have the story garbled). One of the guys sitting on the floor was our assistant waiter, Leo. Then for the finale many of the performers came back on stage to play a couple of songs on sets of tuned sticks, each of which makes a note when shaken. The Filipino crew show was on April 26, the day after our stop in San Juan. It started with a rousing full cast number then, in contrast, a solo guitar set from a very good guitarist. After an appearance between acts of an angel (played by Kaye, our wine steward), a group of women with straw hats performed a hat dance, with hats moving from head to head. Another group of women did a dance using large scarves, which they later folded into turbans. Then Nestor, another wine steward who works near our table and produces the show, sang a solo song. The song was not in English, but he was dressed half as a man and half as a woman. We don’t know what that was about, but Nestor is a very good singer. The last performance involved a large group wearing white gloves that glowed in the dark. They put their gloves together to form different pictures and messages. It was quite impressive and showed a lot of work. Unfortunately, we weren’t able to get a decent picture until after the lights went back on. Then everyone was back on stage for the Finale. On April 27, the day before we arrived in Ft Lauderdale, there was a final assembly in the Queen’s Lounge for summing up and farewells. Captain Mercer and Hamish the cruise director both addressed the assembled passengers and there was a special moment as they celebrated the retirement of Barbara the location guide after some 25 years and countless voyages. She was very good and will surely be missed. Amsterdam was headed for a weeklong dry dock after it dropped us off in Ft Lauderdale and they began preparing for that work as we crossed the Atlantic. Outside our window workers were putting down a plywood covering over the teak deck. Meanwhile, inside our cabin our suitcases were being packed with what seemed like a lot more stuff than we started out with. Our last sea day was dark and wet. During the afternoon the Captain came on the loudspeakers to inform us that a waterspout had been spotted off our starboard bow. A waterspout is basically a tornado occurring over water rather than land. We had never seen that before so we went out on deck to see it. There were actually two waterspouts, one of which moved toward and then past the other. Quite a sendoff from the ocean! 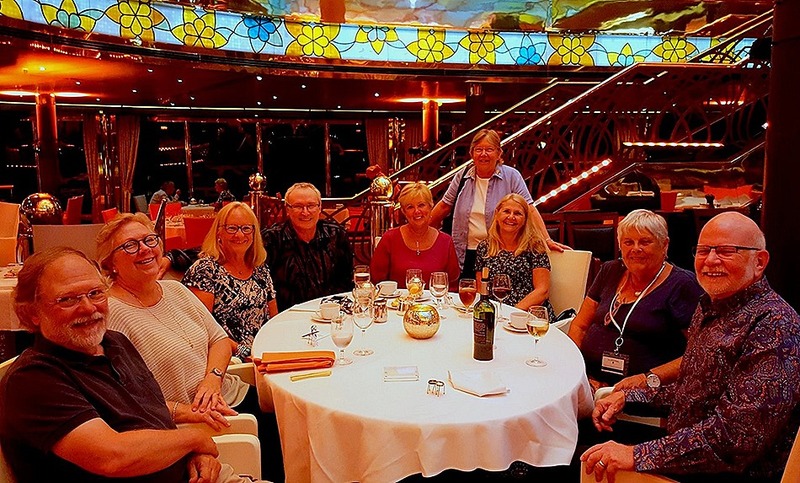 We had our final night on board then disembarked the next day, April 28. We picked up our car and drove to St Petersburg where we spent three delightful days with Mary’s aunt & uncle, Irene and Michael. Then home, where we began posting all the episodes of this amazing voyage to the blog, where you are reading them. Ending an epic voyage like this one and saying good-bye to all your friends and acquaintances is sad, but getting home after four months away is always a good feeling (even if you do have to start cooking and cleaning for yourself again). Hopefully we will get to do this again one day. This entry was posted on September 14, 2018 by Rick. It was filed under Around The World Again . What an epic voyage. Thanks for the blog! Good to hear from you Kevin. Say hi for me to all my old friends & colleagues at the FEC. Thanks for all your time and effort in posting all your stories and photos. I’ve thoroughly enjoyed your accounts and the memories they stirred of our world cruises aboard m/s Amsterdam in 2012, 2014, and 2017. I hope both you and we can do it again sometime. I’ve truly enjoyed your very lengthy cruise and learned much via your professionally done journal. I still don’t think I could spend that much time on a cruise ship no matter what its itinerary was. I read recently that the Prinsendam is no more in December of this year.